There are many instances where we need to access a remote computer in our daily life. Those computers may be your friend's or office computer. We have many remote desktop accessing tools available, but I recommend one new tool comes with Google Chrome browser. It is a free Chrome extension which lets you access a remote computer using Google Chrome web browser. 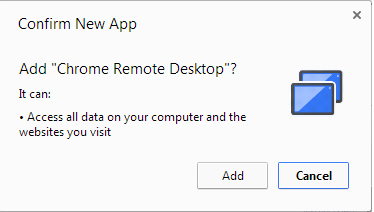 This app is known as Chrome Remote Desktop. Using it, we can either let a friend access our computer remotely or access another remote computer. One of the major advantages of using this app to access a remote computer is its support for various Operating systems. It supports Windows, Linux, and Mac PCs. They claim virtually Google Chrome Remote Desktop can access any devices using a Web browser. Login to Google account on Chrome browser and visit the link below. This extension is very user-friendly, and you can learn to work by following the instructions with it. We know Google Chrome offers many features like Accessing a friend's computer with his permission or take full page screenshot using Extensions. Now it is the time to check some of the cool features offered by them. Even we can play various games using their web browser without downloading them. Not just advance techniques like accessing a remote computer using a Web Browser, we can have many simple tasks using it. One of them is the simple notepad tasks. We can use it to type and save notes just like in notepad. To use this feature, follow the link below. How to Use Browser to Open Online Notepad? While accessing a remote laptop using Chrome, you may see compatibility issues if you have downloaded the older versions of the Google Chrome Web Browser on your PC. How to Set Auto Resume Failed File Download Feature On Chrome Browser? Since we are about to go for Remote accessing using Chrome browser, it is better to learn basic security threats. How to Download the Latest Google Chrome Offline Installer? A newbie user may set the system settings to allow access to anyone without understanding the great risk associated with it. Before using features like this, it is important to learn the basics of Internet security, and we have a list of basic security tutorials. One of them is the TCP split handshake attack, and I suggest you read it for a start. To learn more about it click on the link below. To master the security threads related to accessing a remote computer on the Chrome browser, you must understand the steps to perform a continues Ping operation and changing the size of a Ping packet.